This is a story that comes full circle; this is a story of a young boy who grew up in the countryside, left for bigger adventures as he grew in a young man, only to return where it all started, no longer a child, but a man with stories and life experiences. The countryside, just like the man, has changed: both are enriched by what has been learned, seen and experienced along the way of life. Nicola De Gregorio, born in 1977, grew up in Cammarata, a small town located inland of Sicily. He grew up there, but left the countryside as soon as possible, as his adolescence called him to discover new places. Nicola followed that calling, leaving the woods of Cammarata for the urban forests of the Zen 2 neighbourhoods of Palermo. There, he served as a conscientious objector and he realised that his life needed a change of direction. Originally an Engineering student by mistake, he switched to the Arts & Humanities faculty. Eventually, he graduated in anthropology, but not before he had lived some adventures. The first adventure began in 2001 and lasted until 2011. Caravan traveling or “hitchhiking”is a collective journey where everyone is free to participate. It brought Nicola, together with a diverse group of companions, to the rural areas of over half of Europe, North Africa and Turkey. The second adventure also began in 2001. Nicola followed a course as an Ethnographic Gatherer/Collector as part of the Faculty of Arts at the University of Palermo. Thanks to his work, he became an official Ethnographic Gatherer/Collector at the Atlante Linguistico della Sicilia, the Linguistic Atlas of Sicily (ALS). During the second adventure he met Jolanda, who was first a friend, then a companion, a colleague. Later down the road, this story leads to part of Nicola’s third adventure as Jolanda is now his wife, and mother of their children, Irene and Greta. In 2009, Nicola reached a milestone as he began to prepare for gradation, writing his thesis about traditional Sicilian breads and focaccia. Writing wasn’t new to him, however; a project Nicola started before graduation, finishing afterwards, was writing Cibo e parole di una comunità di montagna, ‘Food and words of a Mountain Community’, a linguistic essay on the gastronomic culture of Cammarate which was published in 2007. He wrote another essay on the baked meats of the Peloritani mountains, prepared and cooked for the occasion of sacred and secular festivities. Important to his story, is Nicola’s “centre”, his relationship to the land of his ancestors which can be found at the – almost metaphorically – centre of Sicily, between Agrigento, Palermo and Caltanissetta. In the spring of 2011, he began to feel drawn back to the land. It was almost mystical and magical, that his studies of linguistics came into play here. Returning back to the countryside, he saw eighteen old pistachio trees which remained on the land from his grandfather – they were spectacular, but abandoned. Nicola thought about the magic of this place and the magic of linguistics: Fastuchera is the Italian word for ‘pistachio field’. Fastuchera is also similar to the Italian word fattucchiera which means ‘witch’ and evokes enchantment, magic, and mysticism. He was enchanted by the pistachio fields and he decided to return back. The Nicola who left when he was a child loved to explore the countryside. It is no surprise that the Nicola who returned carried that same spirit, now an anthropologist, and a man who wants to restore the green landscape within Sicily. To do so, Nicola decided to research ancient Sicilian varieties of fruits, vegetables and grains. He is a man who stands for biodiversity, and who stands against herbicides, chemicals and the obsession with the yield per hectare. 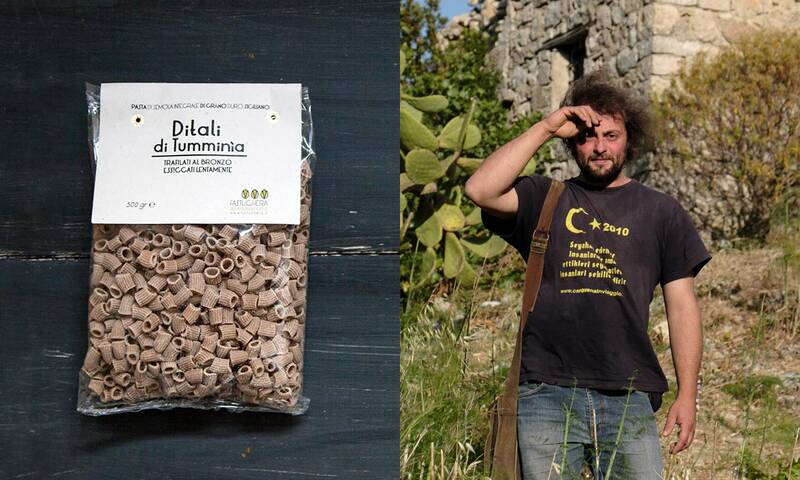 The 16 hectares of his grandfather’s pistachio trees are recovering with biodiversity. Nicola’s dream is to live long enough to see the trees he planted, grow. The Fastuchera, the pistachio field, gives the company its name and it represents its biggest treasure. The Bianca della Montagnola variety of pistachio is grown, which is an ancient and almost extinct variety. Thanks to rootstocks and plantings, 18 pistachio trees have become 118. 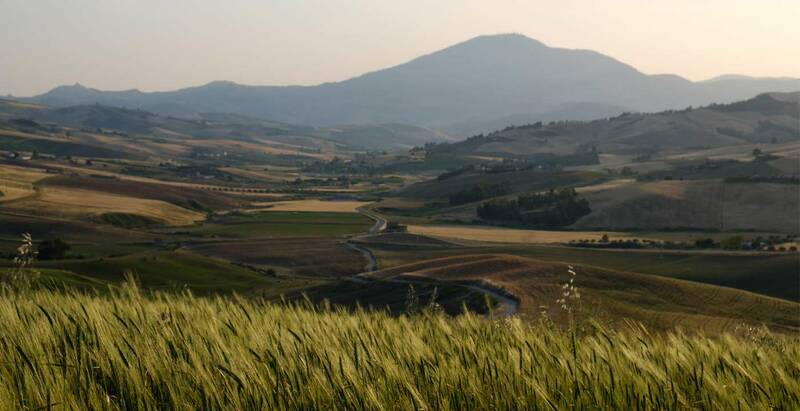 Nicola also grows fields of Tumminia, or Timilia, durum wheat – the Sicilians never come to an agreement on the name, but it is a blond and ancient grain variety, low in gluten. It gives a sweet bread or pasta a specific flavour, so unique it can’t be explained by words. Taste it, because it’s for you that we have chosen this product.